This year’s historic strike wave is an indictment not just of the retail giant’s business model but of our broken labor laws. 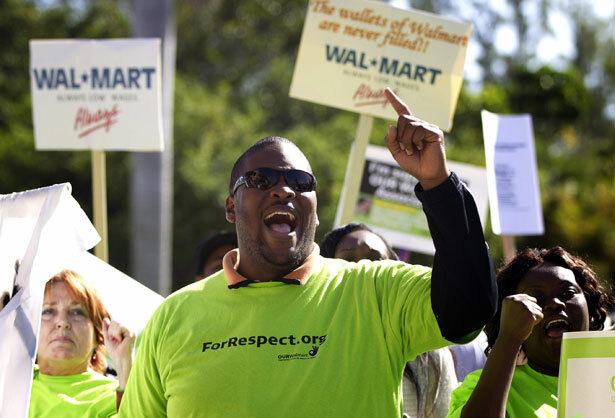 Walmart workers made history on Black Friday. When some 500 workers walked off the job in 100 cities, they pulled off the biggest US strike against the biggest private employer in the world, as well as the strongest-ever challenge to the dominant player in our economy. Walmart, which directly employs one out of every 100 US workers, has pioneered a business model based on low labor costs—and perfected the unionbusting tactics that keep them that way. The Walmart model has been forced on the company’s contractors and suppliers and embraced by many of its competitors. That makes this year’s work stoppages against the retail giant the most significant US strike wave of the twenty-first century. This rebellion is an indictment not just of Walmart’s business model but of our broken labor laws. Walmart workers, like their counterparts in other industries, confront a grim truth: although American law promises to “promote” collective bargaining, it has proved an utter failure at restraining employers set on evading it. Companies stonewall or intimidate employees at will, and absent canny strategy and inspired organizing, the law leaves workers hanging out to dry. The Black Friday strikers were emboldened by the knowledge that the law bans permanently replacing workers who strike because of employer retaliation; Walmart clearly had retaliated against activist workers, deploying a battery of sketchy firings, steep cuts in hours and surveillance of employee activists. But workers also know that Walmart has defied such laws with impunity in the past. The law is supposed to punish companies that retaliate against their workers; by going on strike, workers showed they knew they’d have to do that themselves—and at no small risk. Similarly, while the law promises protections like workplace safety, Walmart employees—like generations before them—find they must organize and strike to secure such basic rights. Union-backed nonunion labor groups like OUR Walmart have grown rapidly over the past two decades, as have “comprehensive campaigns” that leverage media, political and consumer pressures against employers. But although they are useful, too often such campaigns—like the one waged by some unions against Walmart a few years ago—ask too little of the workers themselves. As Walmart workers have shown this fall, there’s no substitute for a strike. What next? Organizers promised that this latest strike would signal a “new permanent reality” at Walmart; as they picketed on Black Friday, workers were already discussing when they’d walk off the job again. To escalate the pressure on Walmart, the campaign will have to build on two key strengths. First, it will have to remain a movement of workers throughout Walmart’s supply chain, including warehouse workers, who helped spur their retail counterparts to strike but played a lesser role on Black Friday. Those workers are best situated to disrupt Walmart’s just-in-time logistics. Consider that perhaps the world’s greatest labor victory against Walmart came after warehouse workers in Britain threatened to keep beer from reaching fans in time for the 2006 World Cup. Second, the campaign will have to remain deeply rooted in individual stores, developing worker leaders who can organize co-workers to take immediate action against abuses. The new focus on pushing employees to enlist co-workers in confronting local management—rather than just flying workers to press conferences at Walmart headquarters in Arkansas—helps explain why this campaign has outpaced its predecessors. It’s the only way the Walmart insurrection can grow from strikes of hundreds to strikes of thousands. Walmart is still a formidable foe: gigantic, flush with money and political juice, undeterred by legal constraints, and willing to endure great costs and terrible press to maintain its dominion over employees. But if Walmart is allowed to keep on abusing the basic rights of its workers, we’ll be in for a low-wage economy, an even weaker labor movement and a diminished democracy. Walmart workers have a long, hard road ahead. But they’ve already revived hope that there is an alternative to Walmartocracy. Also in this week’s issue, Gabriel Thompson reports on the successful student movement to raise the minimum wage in San Jose.